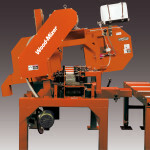 This quality, single-head resaw was designed to run all day for many years. The steel track and heavy duty construction makes for a machine that will need minimal maintenance. Angled side rollers pull material tight against the belt and the sawing head can tilt to produce angled material. The compact size and simple operation will fit seamlessly into high production operations to small workshops. The durable steel belt provides longer life and less downtime than rubber belts. The cutting head (not the track) tilts up to 8°, leaving the track flat to easily integrate into material handling system. Material is continuously driven down against the steel conveyor belt to ensure an accurate cut. 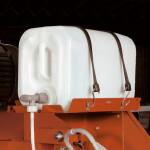 An optional pressurized blade lubrication system prevents sap build-up and increases feed speeds and blade sharp life.